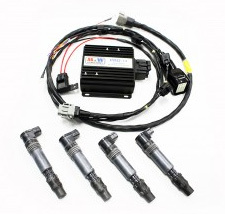 The Pro 14 CBR kit can be used with any ecu with at least 4 ignition outputs.Our M&W Pro 14 kit consists of (1) M&W Pro 14 ignition amplifier, (4) new OEM Honda CBR ignition coils, and a full custom-built wire harness. Our harness uses high quality multi conductor shielded wire to keep out RF noise and high quality braided loom on all wires. We use a mil-spec DTM connector for the coil sub harness, and new OEM connectors for the ignition coils, not used connectors spliced in. Kit comes ready to install, just hook up to the battery and splice in your signal wires at the ecu. M&W 4 channel CDI Ignition amplifier The Pro 14 is M&W's 4 channel ignition amplifier. This is generally used in 4 cylinder applications for a direct fire 4 coil system, or for 6 or 8 cylinder engines to run in wasted spark mode. 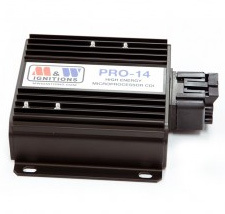 The Pro 14 is one of the finest quality ignition amplifiers you can buy. 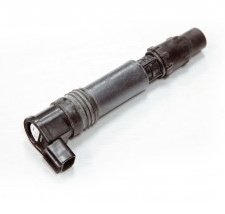 The Pro 14 includes the ignition box and a mating connector. A custom wire harness must be made, we offer custom harnesses if needed, please call for more info on them. Denso CBR coil on plug coil.